Mark Twain? Oxford Student? Frenchman? Lewis Carroll? Schoolchild? G. K. Chesterton? Israel Zangwill? Charles Lamb? Benjamin Jowett? Aldous Huxley? Anonymous? The Homeric Poems were not written by Homer, but by another person of the same name. The plays of Shakespeare were not written by Shakespeare but by another man of the same name. 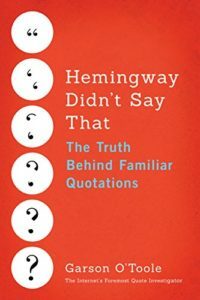 These remarks have been connected to well-known humorists and literary figures, e.g., Mark Twain, G. K. Chesterton, Lewis Carroll, Israel Zangwill, and Aldous Huxley. Would you please explore the history of these expressions? This rivals the new discovery about Shakespeare,—that the well-known plays and poems were not by William Shakespeare, but by another person of the same name! An analogous quip about Homer was published in a periodical in Oxford, England in 1874. Celebrated writers, such as Mark Twain and G. K. Chesterton, did employ versions of this joke, but they did not claim coinage. Details are given further below. Anthony Burgess? Israel Zangwill? Carolyn Wells? Merry-Andrew? Abraham Rotstein? Anonymous? Every dogma has its day. These words were credited to the English author Anthony Burgess who is probably best known for the novel “A Clockwork Orange”. Can you tell me when he said this? Quote Investigator: Burgess did write about dogmas, but QI has not located this punning aphorism in the corpus of his works. As the questioner notes the wordplay is based on modifying the idiom “Every dog has its day” or “Every dog has his day”. This basic expression dates back to the 1500s according to the Oxford English Dictionary, and it typically denotes that each person has a period of influence, success, power, opportunity, or good luck during his or her life. Carolyn Wells, the author and composer of light verse, used a version of the saying by 1898. Israel Zangwill, the British playwright and humorist, also used the saying by 1898. Each of these individuals sometimes receives credit for the comical aphorism in modern times. Mesmerism, electro-biology, clairvoyance, spirit-rapping, and the séances of those ingenious jugglers the brothers Davenport, have all been ostensibly based on some occult principle in physics of which the existence has been emphatically declared, but which no one has been able to explain. But every dog—not to say every dogma—has its day, and one by one the exponents of these mysterious doctrines, as well as the doctrines themselves pass into oblivion.